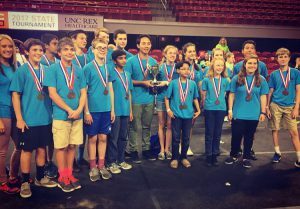 Congrats #TeamWAAS for placing 4th in North Carolina at the state Science Olympiad! We improved our score last year (310) by almost 80 points to 234. We were a mere 11 points away from 3rd. We are state champs (earning 1st in the state) in Bottle Rockets (Farhan & Hannah), Scrambler (Kyler & Hannah) and Write It, Do It (Emma & Hannah)! We placed in the top 10 in 15 out of 24 events and competed against 50 middle schools from across North Carolina. The consistent high scores across the board in all events contributed to the overall team score and our earning of 4th Place. It was a team effort of which all team members contributed. Additionally, this is the second year the Scrambler team placed 1st in the state! Hannah placed first in all THREE of her events and Anna placed in all FOUR of her events. Emma placed in FOUR of her FIVE events. Others placed in all of their events, including David, Yates and Ian C! Simply outstanding. Proud of all.